The 2017 Bethlehem Air Show was a great success. The large crowd that turned out were treated to non-stop action and variety. Apart from the spectators that packed the airport many more parked on roads and open spaces all around the venue. Apart from the amazing flying there were many stalls, food kiosks and activities for children. All in all, it was a wonderful event that had aviation enthusiasts and first-time air show visitors gasping in wonder at the displays. The weather forecast early in the in the week, building up to the show, did not look favourable for the show. Rain, cold and strong winds were predicted. This could have had the effect of reducing the number of displays. On the day however, this proved to be unfounded and a full programme was put on for a large and enthusiastic crowd. The morning was cold and there was a fairly strong wind blowing but conditions improved throughout the day. The cloud base was high enough and the rain did not materialise. 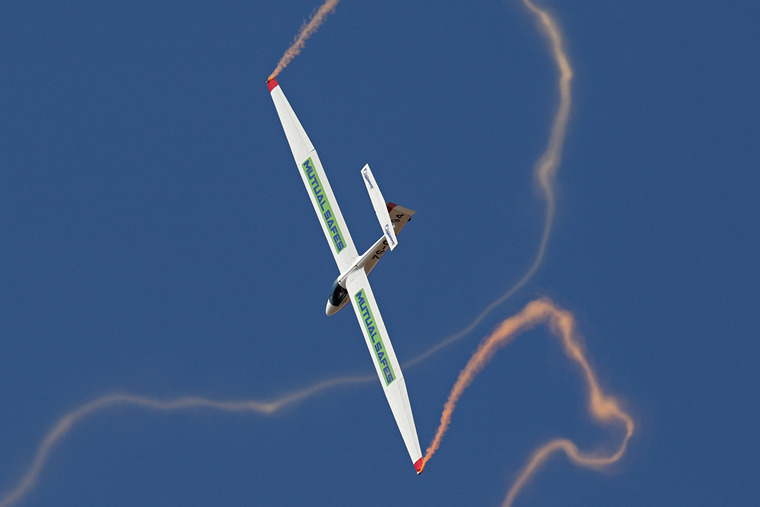 The show was supported by the Dihlabeng Local Municipality together with several other sponsors, including Oranje Print and Packaging, Bethlehem Aero Club, SAB and OFM. Kicking off the day was the impressive Bell 222U, ZS-HSK flown by Andre Coetzee of Henley Air. He was followed by the Antonov An-2, ZU-JLM “Little Annie,” flown by Jon-Marc Hill. It is always amazing to see how such a large aeroplane can fly so slowly, great to watch. Matthew Waleski then gave a spirited display in the Magni Gyro, ZU-CSO. 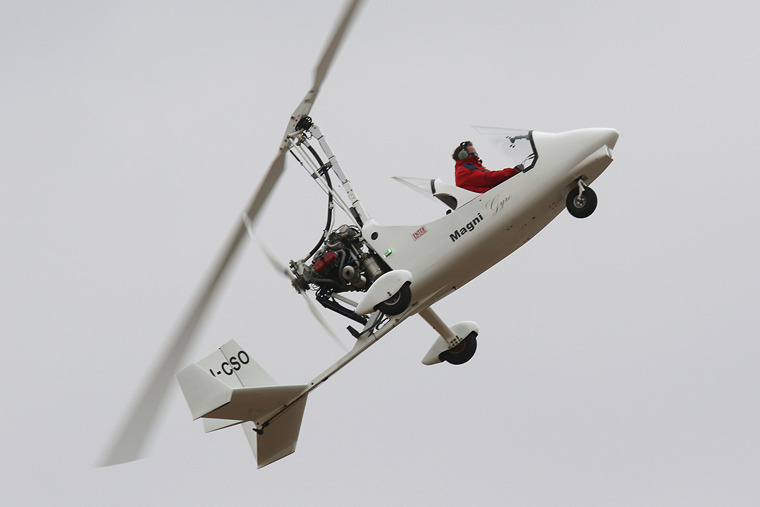 Throwing the gyrocopter around the sky, he showed just what these machines are capable of. 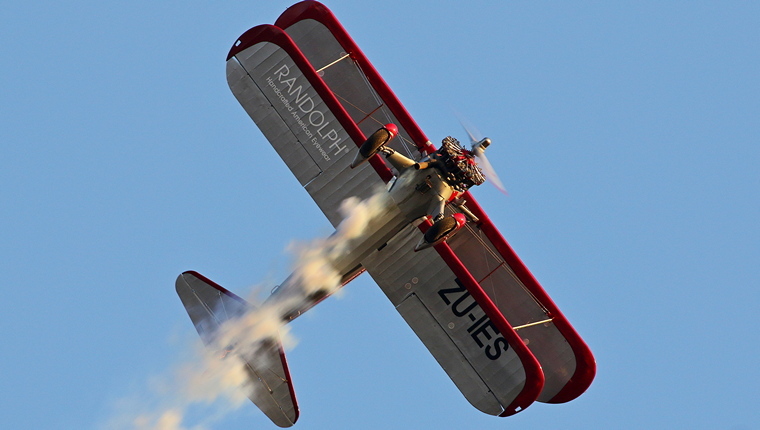 Next up was the Boeing Stearman, ZU-IES of Ivan Van Der Schaar. This immaculate aircraft and the way it is demonstrated, always attracts attention. 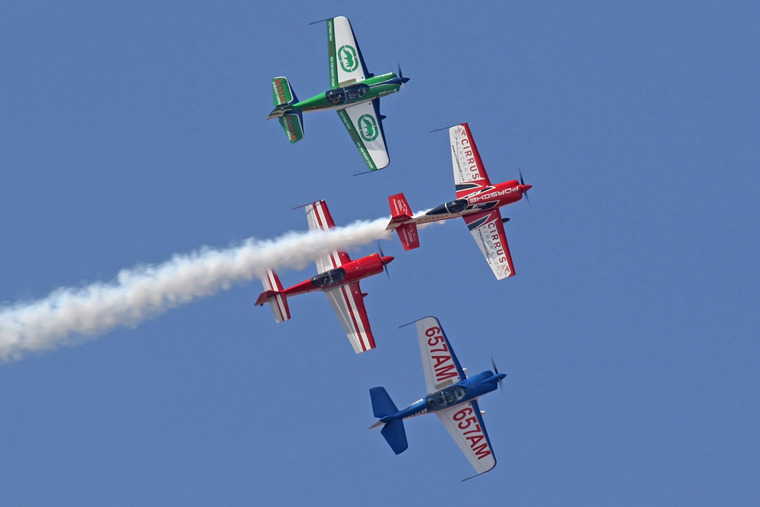 Then we had the four-ship formation aerobatic team of Nigel Hopkins, Extra 330SC; Mark Hensman, MX2, Mark Sampson Sbach 342 and Jason Beamish, Sbach 342. This team of top level pilots gave an amazing display of flying. There was so much variety and individual (and team) skills on display. The team did two displays during the day. 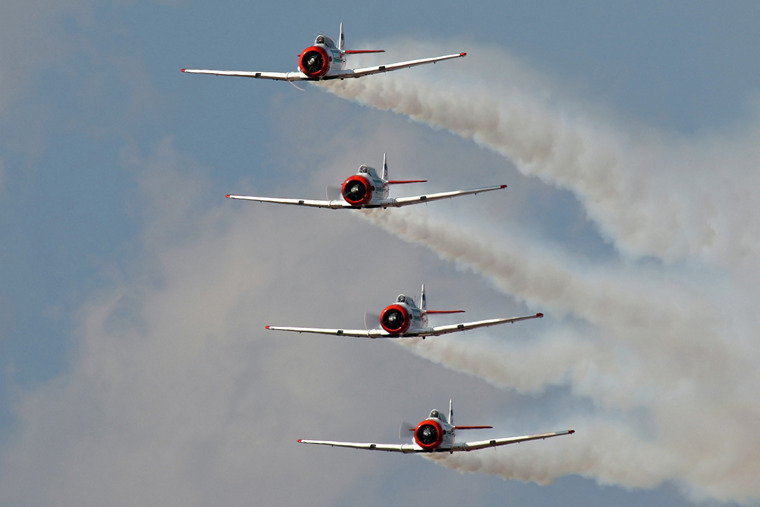 Then we had South Africa's crack Silver Falcons performing a five-ship display to their usual high standards. There were two parachute drops from the Antonov, one in the morning and one in the afternoon. The only incident of the day occurred when one of the skydivers landed awkwardly. When he tried to walk he felt pain and the air show safety plan kicked in. The venue operations centre was activated and functioned perfectly. The patient was transported by ambulance to hospital for x-rays and returned a little later wearing a moonboot for the post air show braai! He will need to have a tendon reattached but is otherwise ok. This was a minor incident in the scheme of things but the organisers had prepared for all possible incidents. The rest of the show was completed safely without incident. Neville Ferreira gave a great solo display in his unique Slick 540. Neville keeps adding new sequences to his displays and as always gave a compelling performance. 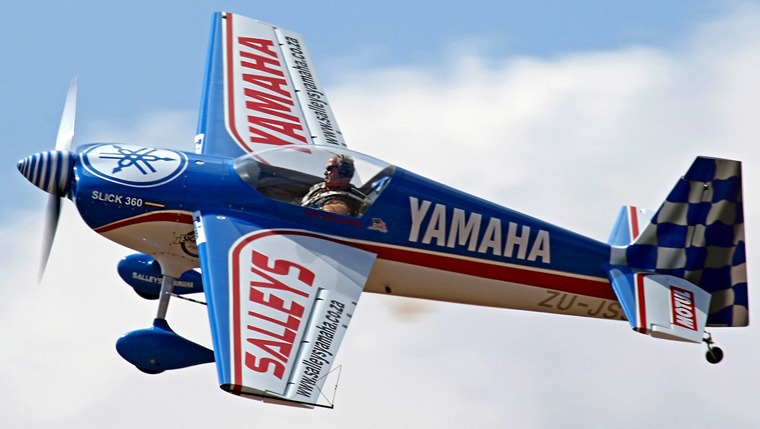 Like some of the other pilots displaying today, he is looking forward to the upcoming World Aerobatic Championships to be held in Malelane, commencing on the 9th of September. Next the beautiful Aero Vodochody L-39, ZU-IBN was displayed by Pierre Gouws, always a treat. 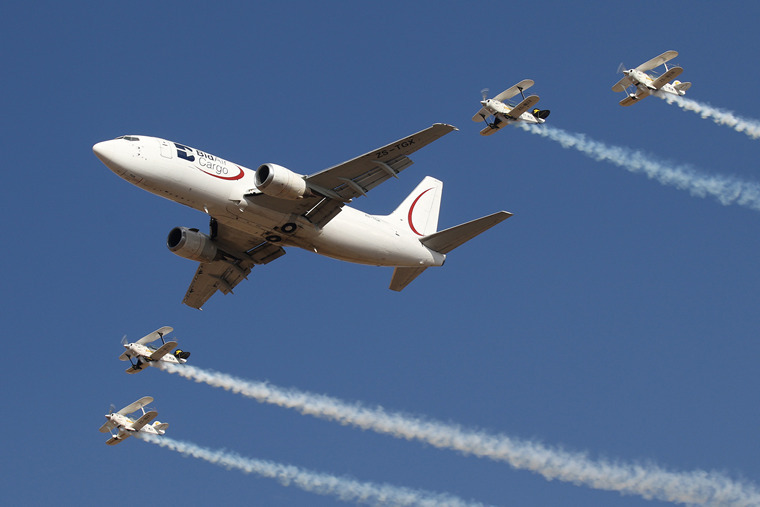 The Goodyear Eagles gave two team displays on the day and also flew in formation with the 737, see below. 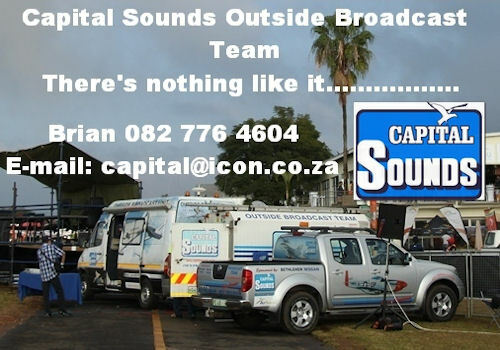 The team is made up of Nigel Hopkins, Jason Beamish, Johan von Solms and Paul Coetzer. The Flying Lions in their Harvards gave a high energy display filled with precision flying and lots of noise and smoke. The crowd were vocal in their appreciation of this wonderful team comprising Scully Levin, Ellis Levin, Shaun Thackwray and Arnie Meneghelli. The team displayed twice during the day. 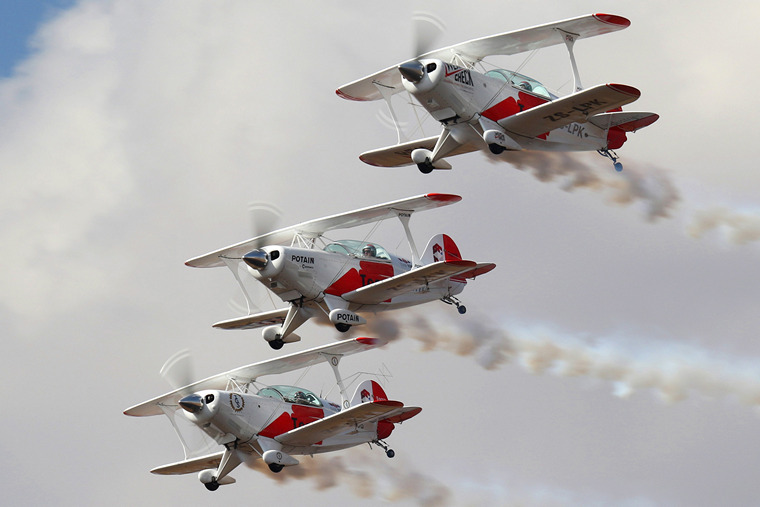 Then a three-ship formation team comprising Mark Hensman in the MX2 and two RV-7s flown by Larry Beamish and Pierre Gouws took to the sky. 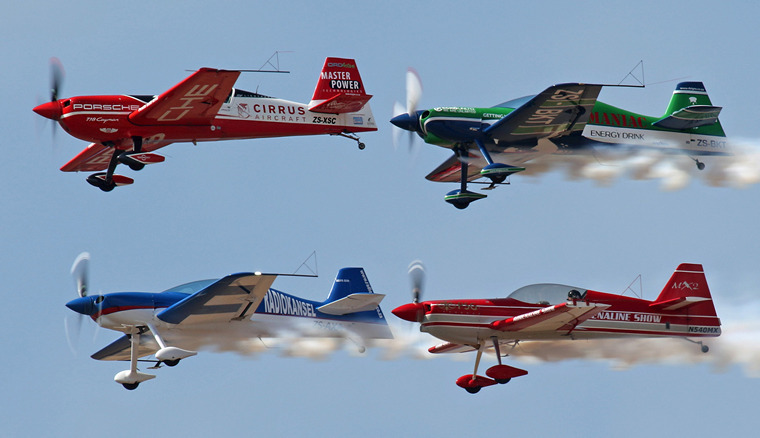 Their routine was excellent as is to be expected from three of South Africa's top pilots. 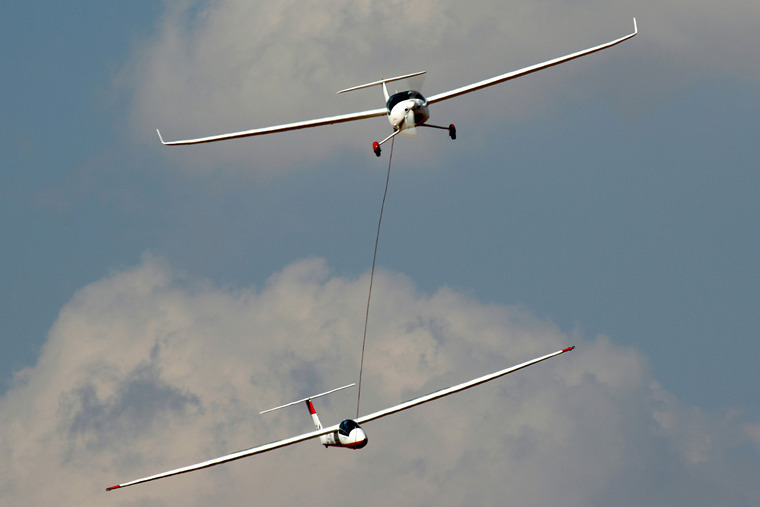 The Pilatus B4-PC11 glider followed and was beautifully flown by Gary Whitecross. Streaming pink smoke from the tips of its long wings, Gary did some aerial art in the sky. He did two shows on the day and both times the tug aircraft, a Lambada, was flown by Derek Hopkins. Another fine performance followed next of Slick 360 piloted by Conrad Botha. Then the two-ship jet display team took to the skies. 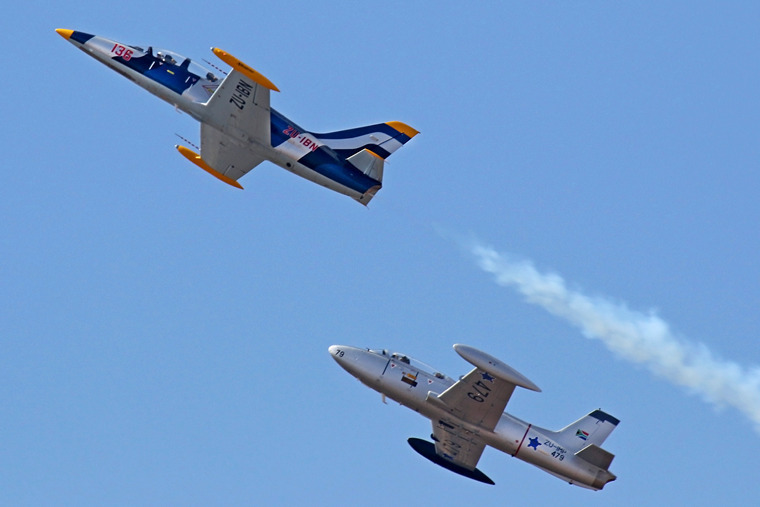 The aircraft were an Aero Vodochody L-39 flown by Pierre Gouws and an Atlas Impala Mk1 flown by Denel test pilot Mike Weingartz. 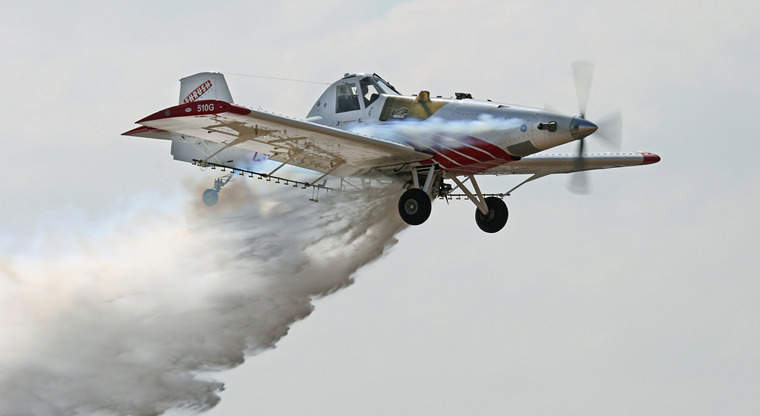 Next up was a Thrush S2R crop sprayer demonstrated by George Orsmond. The aircraft's spray tanks were filled with water for the show and George did a number of passes one being a spectacular water dump in front of the spectators. The Team Torre Aerobatic Team were next to display in their Pitts Specials. 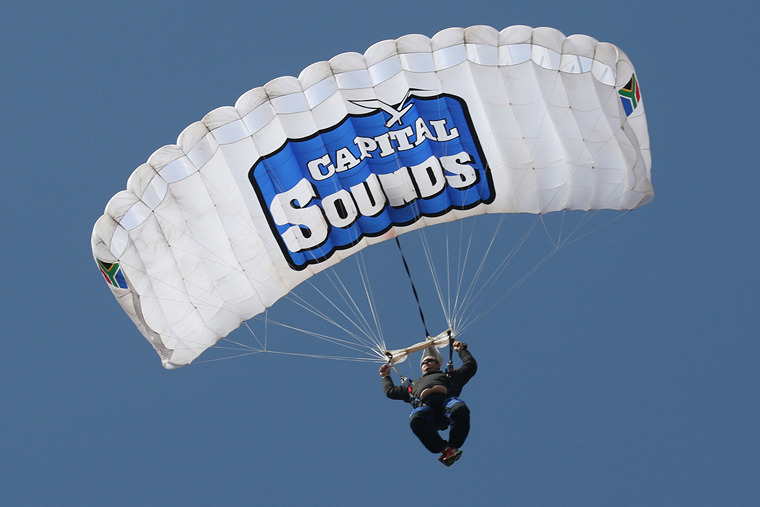 The team has the very experienced line-up of Scully Levin, Ellis Levin, Shaun Thackwray and Arnie Meneghelli and gave the crowd their usual brand of aerobatic magic. A feature of the afternoon was the appearance of a BidAir Cargo Boeing 737-341 flown by Michelle Dreyer, a Captain with Star Air Cargo and first woman to display an airliner at an air show in South Africa. She flew from the left-hand seat and with her on the flight deck was very experienced pilot in command Dennis Spence. The 737 flew in formation with the Goodyear Eagles giving a magnificent display. When the Eagles in their Pitts Specials broke away, the aircraft was put through its paces in a wonderful solo display, this included one very low pass, that thrilled the spectators. The Silver Falcons flew a second time to end the show with another polished performance. 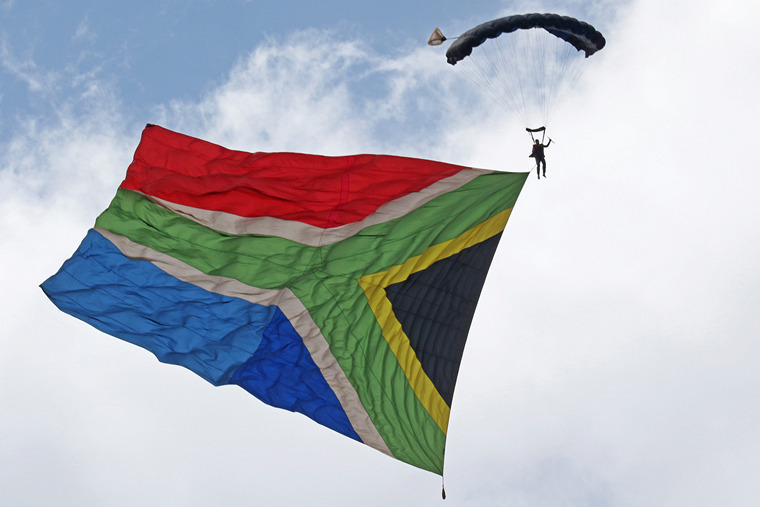 The large crowd had experienced a wonderful air show, the only one held in the Free State. It had been a full days-worth of entertainment that surely inspired all ages, from the elderly to the many young children alike. Roll on the next one. 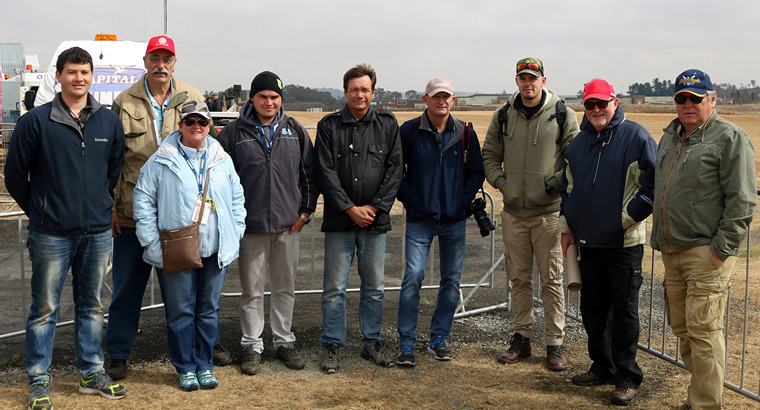 Photo, part of the media contingent at the show L-R : Rugene Frost, Brian Spurr, Fiona Hugo, Jarryd Sinovich, Garth Calitz, Gary Shephard, Gerard Griessel, Pete van der Spek (Media Liaison Officer) and Charles Hugo.